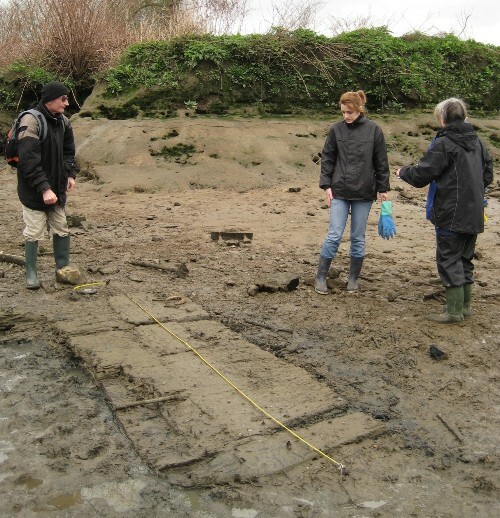 Braving bleak weather forecasts, a group of FROG members joined a handful of Medieval Period enthusiasts on the Thames foreshore close to the site of “Syon Abbey”: http://www.syonpark.co.uk/history.asp in Middlesex, for three consecutive mornings in late March. 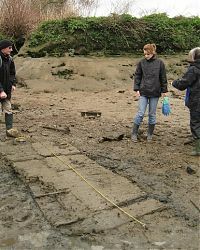 We’d been invited by Laurie Elvin and Richard Farrant , key players in the Syon Abbey Research Associates (SARA) and not even poor weather could dampen our spirits. The aim of the exercise was to record and observe any features that we could find in the brief time available between high tides. By the third day, overnight rain had ensured river levels were not going to be as low as we’d enjoyed on the previous two. 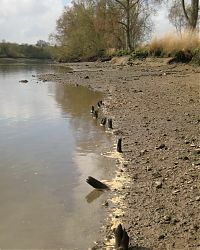 One of the characteristics of the foreshore at Syon is the challenging access to it, across a sizeable and seriously bog-like water meadow. We were very professionally briefed on the hazards and health and safety issues on this particular site by Laurie and Richard. So with a minimum of equipment but dressed up in our most effective waterproofs, we made our way in file across the meadow to one of a handful of little creeks that allowed us to get onto the relative luxury of firmer gravel at the river’s side. 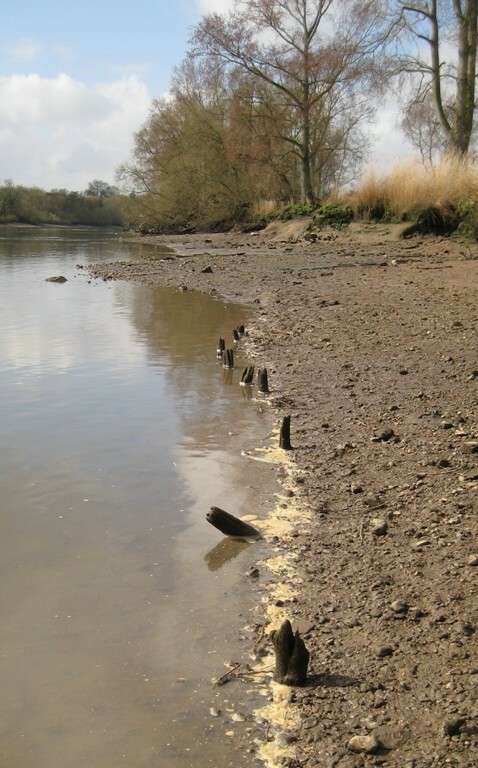 Recording groups of timber posts and reconciling these with records made in 2006. Despite bitterly cold winds in very muddy conditions, we soon found that we were working effectively in our newly formed teams, and got our tasks completed with much welcomed occasional words of advice from our mentors. Laurie and Richard had also very kindly laid on hot drinks and biscuits in the sheltered arcade in the eastern face of Syon House and these were very much appreciated indeed at the end of each day! Everyone not only enjoyed themselves but felt that they’d gained valuable experience and now look forward to further opportunities at this interesting site (if we’re invited). It was agreed by many present that more experience and confidence with recording would be useful and it is hoped that a dedicated session will be arranged in the near future, and that this might take place on dry land where we won’t have to look over our shoulders at the incoming tide!